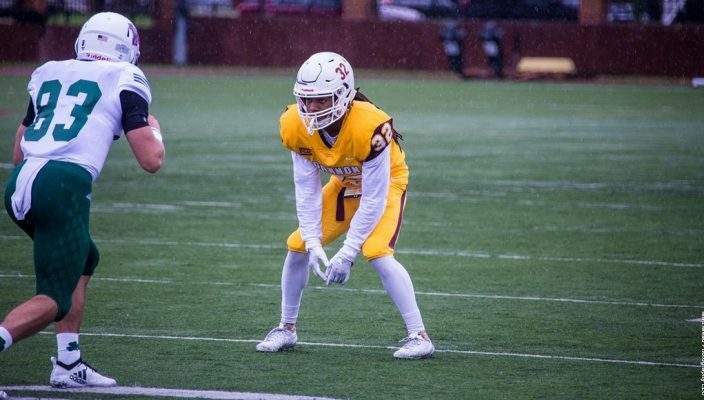 The Gannon University football team dropped its final Pennsylvania State Athletic Conference West Division game of the season Saturday, 48-7, on the road to Slippery Rock. The loss left Gannon with an overall 2-8 record and a 2-5 mark in PSAC West play going into the final game of the season – the annual Senior Day contest, set for noon Saturday against Lock Haven at McConnell Family Stadium. Slippery Rock, meanwhile, improved to 9-1 overall and 7-0 in PSAC play and will host Saturday’s conference championship game against West Chester (9-0, 6-0). The Knights got off to a solid start against The Rock, holding the host team to a field goal on its opening drive and then answering with a score of their own to go on top. Cody Callaway led Gannon on a seven-play, 75-yard drive for what would be the team’s only score. Callaway hit Alex Hutchings for two completions of 25 and 32 yards. He covered the final nine yards to make it 7-3 with 7 minutes, 31 seconds left to play in the first quarter. But Slippery Rock would score the next 45 points in a row to win going away. Wes Hills’ 54-yard touchdown run put The Rock in front 10-7 and Slippery Rock increased its lead to 17-7 after holding Gannon’s offense to two halting three-and-outs. The Knight defense forced a punt to start the second quarter, but Slippery Rock’s defense held once again. The Rock added two more scores – a 40-yard field goal and a 5-yard touchdown pass from Roland Rivers to Dakota Clanagan – to make it 27-7 at halftime. A big play at the start of the second half got the Knights offense going as Callaway found Richard Makowski for 56 yards. A Marcus Jones 4-yard run on a fourth-and-three play enabled Gannon to reach the 1-yard line, but the offense could move no further, and a field goal attempt was blocked. Slippery Rock converted each of its next two drives into touchdowns to widen the gap to 41-7. The Knights looked to be getting some footing at the end of the third quarter, earning a pair of first downs, but that drive stalled as well. The Gannon defense came up with a big stop on Slippery Rock’s longest drive of the game. The Rock made it 85 yards to the Gannon 5-yard line, but A.J. Satcher stuffed the ball carrier for a loss to turn the ball over on downs. Callaway, making his first career start at quarterback, threw for 154 yards and added 34 yards on the ground plus his scoring play. Jones, the Knights’ biggest offensive weapon, was held to 16 net rushing yards in 15 attempts and now sits at 1,298 yards rushing on the season with one game to play. Martell Davis led the Knights defense with seven tackles and two pass breakups. Malachi Woody added six stops and a half sack. Noah Harris-Lyles and Shi’Quan Likely went for five tackles and a tackle for loss. On Saturday, Gannon will look to extend its unbeaten streak against Lock Haven, which dropped to 1-9 after losing to East champion West Chester last week. The Knights are unbeaten against Lock Haven, going 6-0 and outscoring the Bald Eagles 189-41.